Hey all, in this issue of the Staxel Reporter you’ll learn some of our plans for the ‘gathering’ system and get a sneak peak at a new furniture set! With such a rich world and a host of different environments, gathering becomes almost second nature, and the sooner you get started the better! 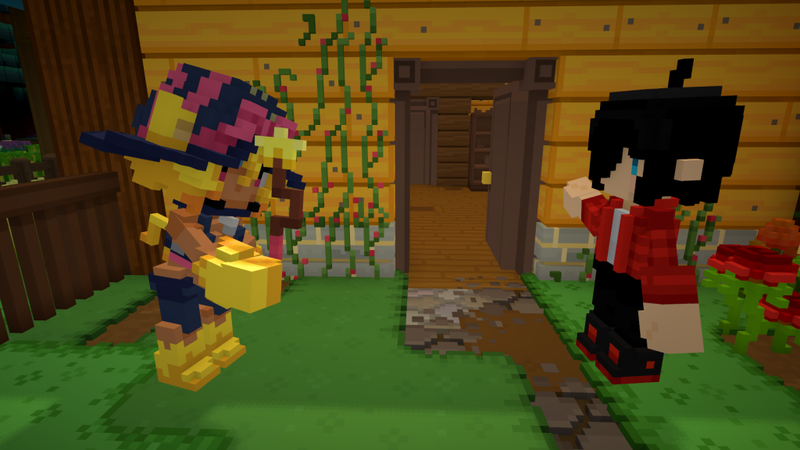 A good deal of Staxel’s gameplay hinges on the various things you’ll be picking up as you navigate the world. Building, for instance, will require the crafting of materials, most of which are created with resources that can be harvested from your world like stone, wood, clay etc. Many cooking ingredients will also have to be sourced by foraging around looking for things like berries, fruits, mushrooms and fish. You don’t have to grow everything on the farm when nature provides it for you. And if you come across a particular flower you like the look of, why not just pick off the seeds and grow some yourself? Gathering is also going to be the first step you take towards completing any collections you decide to start, and with some of the “collectables” only being available in certain seasons you’ll be outside gathering all the time! Finally, you can always make a little extra money from gathering. You’ll be able to sell a lot of the things you pick up on your travels to the vendors in town. This will come in handy, especially early on when you’re just starting up and need a bit of cash to keep things ticking over. So there you have it, a little bit of insight into the possibilities that good gathering techniques will open up for you. So remember, any time you’re out exploring you could be catching bugs, mining for materials, picking fruits and flowers, fishing and collecting all sorts of other things to your heart’s content. Just make sure to bring the right tool for the job! Ever walked into your home and thought “I really wish there was a Contemporary furniture set”? Well have I got news for you! 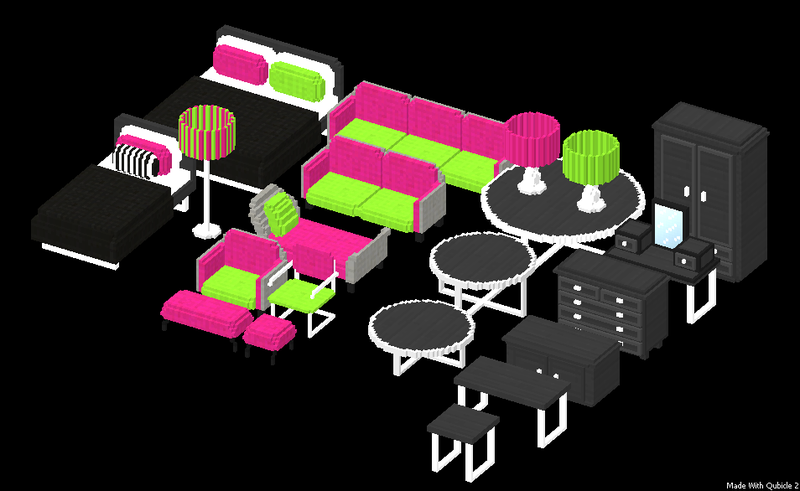 World-renowned designer RazzleberryFox has just revealed her latest range of furniture, affectionately named “The Contemporary Furniture Set”. I have no idea, maybe expand your house? That question is really outside my area of expertise. 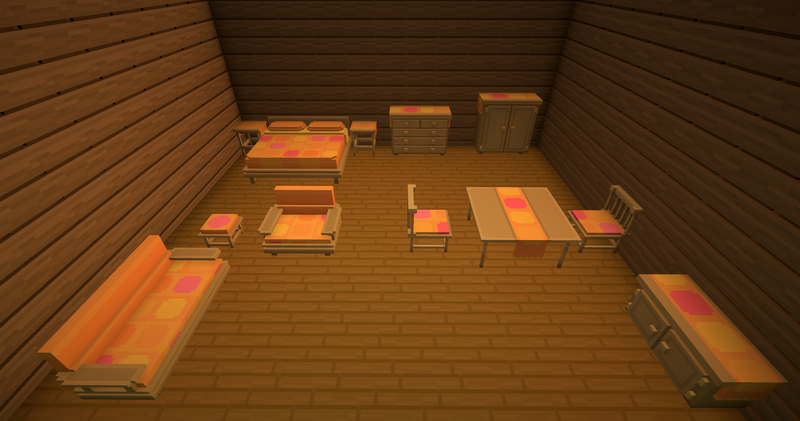 This new furniture set will be arriving in Staxel in the coming week, so keep an eye out for the next update! 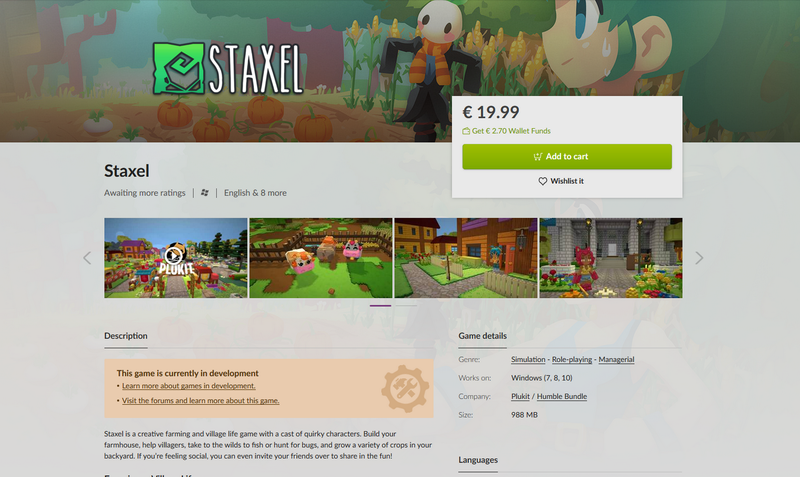 Remember, Staxel’s price will be raised to $10 USD on May the 1st (2016). 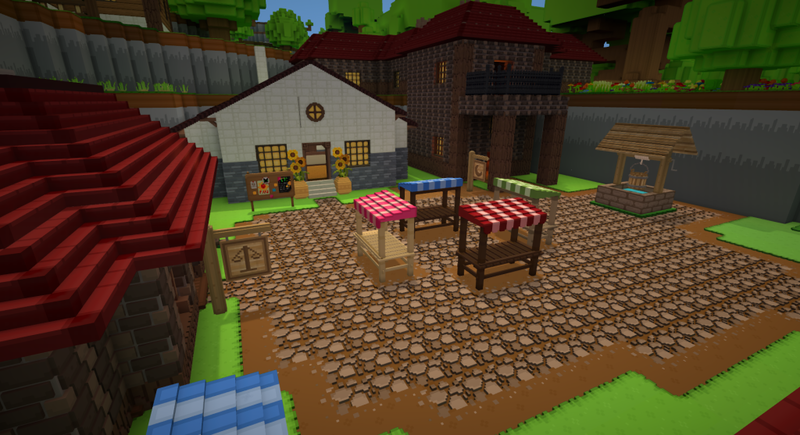 Hey everyone, this issue of the Staxel Reporter shows off our new village built especially for GDC and a brand new furniture set! As many of you will no doubt know the Game Developers Conference is currently in full swing in San Francisco! Some of the Staxel team have made the trip to see check out what’s new and catch up with some other devs and we thought this would be a good opportunity to build a new village just in case they bump into anyone who wants to have a look at the game. Firstly we have a picture of the farm, we tried to keep it a bit more civilised than the last farm with a nice rustic cobblestone path between plots. To the right we have the tunnel entrance which leads out to the main village. Outside of the shot to the left is a paddock and barn, complete with some of the new long grass objects that are also now available in game. This is the view we have of the new village. Upon exiting the tunnel from the farm you’ll be greeted by a handful of cottages in this sleepy village. But don’t let the olde-worlde chic fool you, each home is outfitted with the latest modern appliances and most comfortable of stylish furniture. Overlooking the village is the mayor’s house, feel free to drop in and take a look, he’s never home. Here we have our local amenities surrounding the town square. On the left is the village store, catering to all your most extravagant needs (and with prices to match!). In the centre is the village hall and on the right we have the tavern, complete with tea garden! Lastly we have a postcard-worthy picture of the town well. Beautifully restored to it’s original condition, RazzleberryFox whipped this up for us on request and it looks great! If you want to check it out for yourself you’re more than welcome to. It’s currently on the “alpha” server. Come and visit today but remember, we only open access to our test server periodically so you’ll have to hurry if you want to make your mark! Tired of keeping up with all the latest trends? Shelling out every two weeks to get the latest version of exactly the same thing? 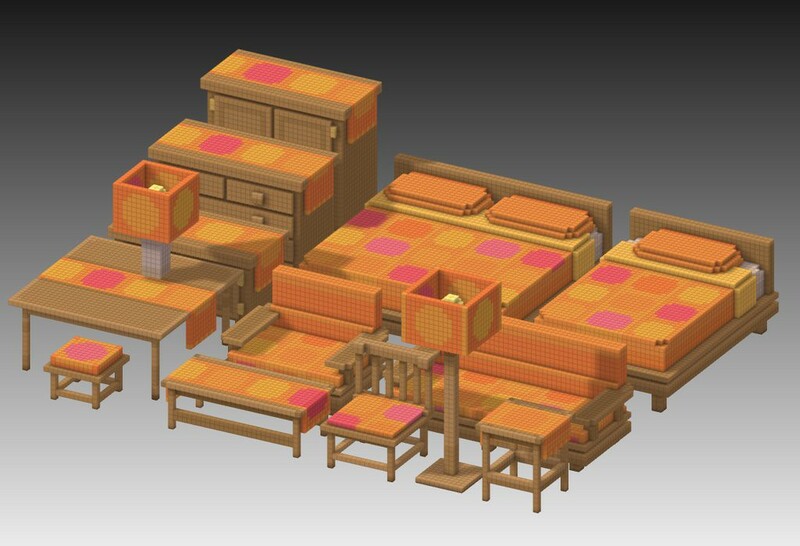 Well now you can get an incredibly old version of exactly the same thing with the all “new” Groovy Furniture Set! We dared to ask this accomplished fashionista what else we can expect from his upcoming range. Well there you have it folks, straight from the horse’s mouth. 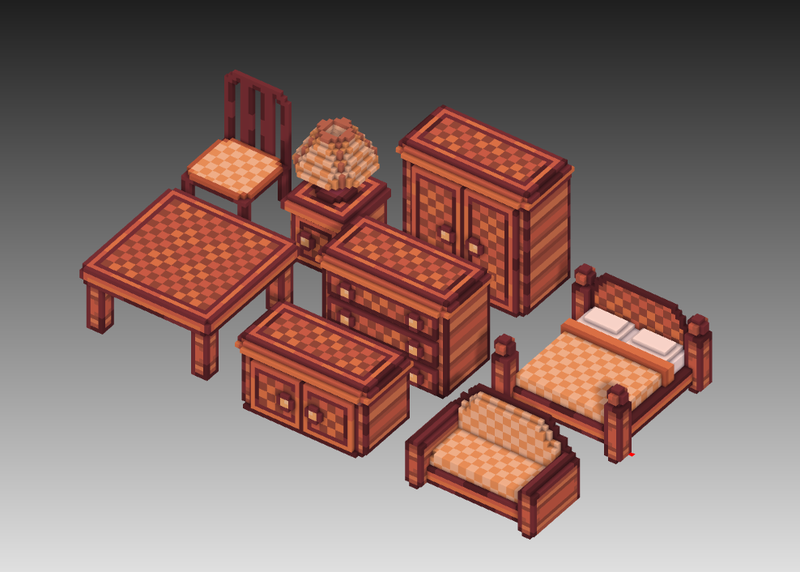 Expect to see a gothic furniture set in the near future! Follow us on twitter, facebook, reddit, our forums or subscribe to this newsletter for the latest updates on Staxel! Hey all! 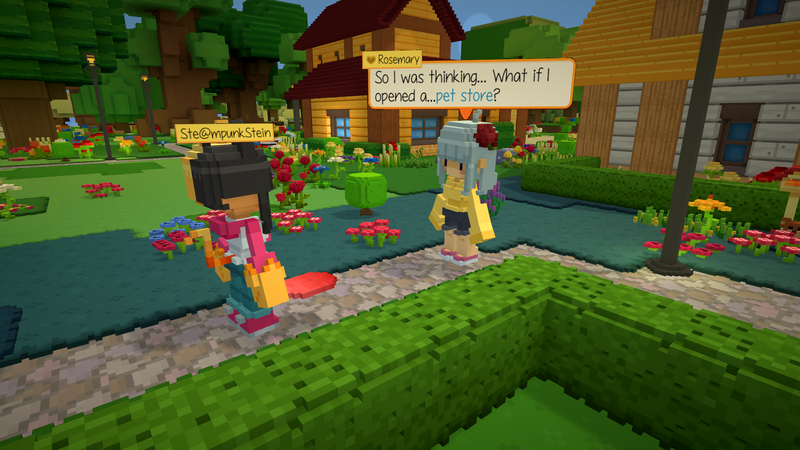 In this issue of the Staxel Reporter we announce some exciting news and give you a little insight into our plans for Staxel’s flowers. Let’s start with some great news, the Staxel team has just gained a new member! More specifically, we’ve brought in an additional artist. She’s currently working closely with SteampunkStein and they’re coming up with all sorts of exciting new things to add to the game. So, without further ado, here’s RazzleberryFox! “Hi! I’m Razz… I am a 3D Modeller and digital artist. I have been making 3D models for a few years now. I started in University and never stopped. I made models and art mostly for Minecraft, I worked closely with quite a few mod makers, also made a mod of my own, Decocraft, and decided that video games were more than a hobby to me, they were my passion and I have been working toward making games look pretty ever since! When I heard the Staxel team was looking for a new member and considered me I was super excited, and now I can finally get to doing something I love and sharing it with all of you! SteampunkStein is currently doing a lot of work on the flower models and on implementing growth stages, so I thought this would be a good time to give you some insight into our plans for flowers in Staxel. Flowers work differently to crops in a few ways. Firstly, flowers won’t wilt if you forget to water them, this will make it a lot easier to create your stunning garden without having to think about the upkeep of all the plants in it. Secondly, colours play a more important role when it comes to harvesting seeds. At first, flowers will only be available in their standard colours but eventually you’ll be able to grow flowers using a wide spectrum of colours and combinations. 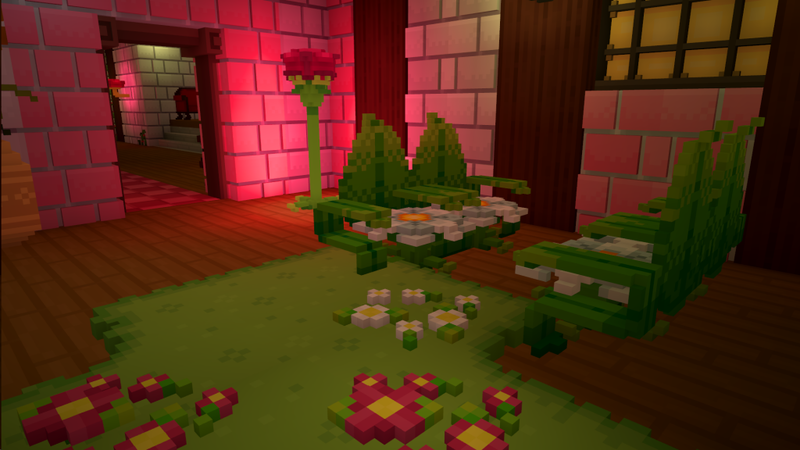 Staxel’s extensive collection of flora is designed to give you endless possibilities when creating your gardens, but you’ll be happy to know that they all follow the same growth pattern. To keep things simple all you really need to do is plant the seeds and then water them until they’re fully grown. I haven’t mentioned everything to do with the features we’re thinking of but I hope this gives you all a better idea of how this system is going to work. We’ve just pushed an update that got our Asset Manager into a working state so I figured this would be a good time to make a guide for basic modding. We want people to really take advantage of the possibilities that modding opens up, and this means getting your own items and reskins into the game should be as simple and straightforward as possible. First off, you’ll be happy to know that mods in multiplayer only need to be installed on the host’s server, if you want to join a modded server you don’t have to install any of the mods yourself! Secondly, before we begin it’s worth noting that you will need to reinstall your mod after any updates as the “mods” folder will be cleared, so make sure to keep backups of any content you create or download. And lastly, at the moment, any modded installation will be considered as failing validation so don’t panic, you haven’t done anything wrong! 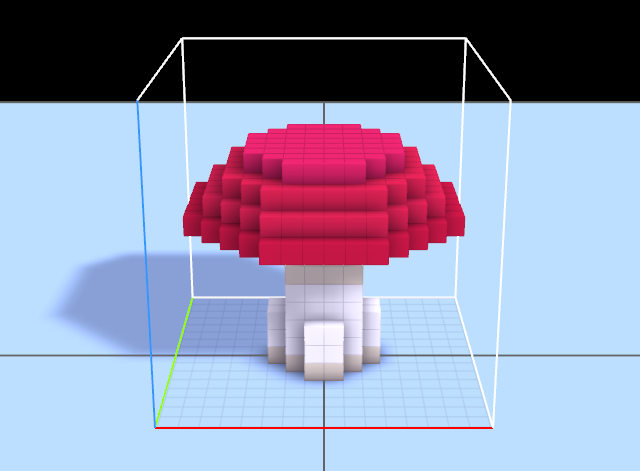 The first thing you’ll need to do is get yourself a voxel editor. Our artist, SteampunkStein, uses Qubicle (http://www.minddesk.com/) but MagicaVoxel (https://voxel.codeplex.com/) is a good free alternative. We’ve also heard some great things about VoxelShop (https://blackflux.com/node/11) from our modders. Basically any editor of your choice that can export to .qb format. 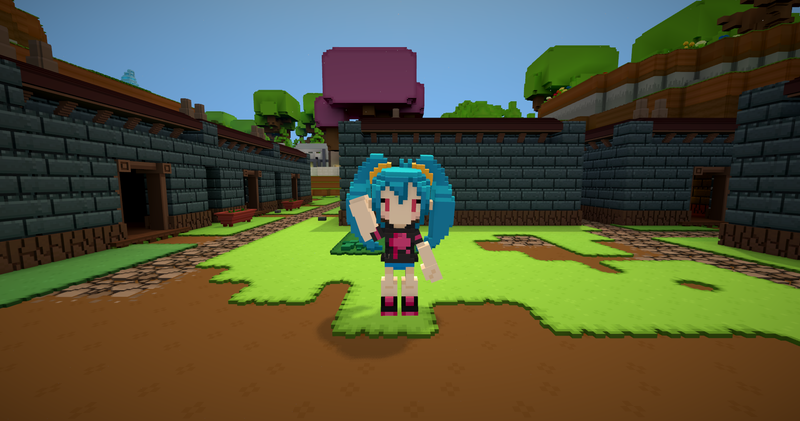 Our wiki is going to be updated with more info regarding different voxel editors and the differences between them soon. Quick note regarding “layer names”. If you’re modding heads, clothing or character items the layer names have to be correct. As we’re just making a simple object you can place in the world we don’t need to worry about that. Like I mentioned before, our wiki will be updated with more information regarding this soon, but one thing you should make note of is that MagicaVoxel doesn’t support multiple layer names. Now it’s time to start making the items you want. There are no colour restrictions, but it’s best if you try and stick to multiples of 16x16x16 grids. For example if you want to make your item taller than one block, you’d use 16x16x32, longer than one block would be 32x16x16 etc. When you’re finished designing your model you’ll need to save it to the mods folder as a .qb file. The default path to the mods folder is “%localappdata%/Local/staxel.launcher/gamedata/content/mods” and while not completely necessary, it would be a good idea to make a new folder for each modpack you create to avoid any confusion later on. 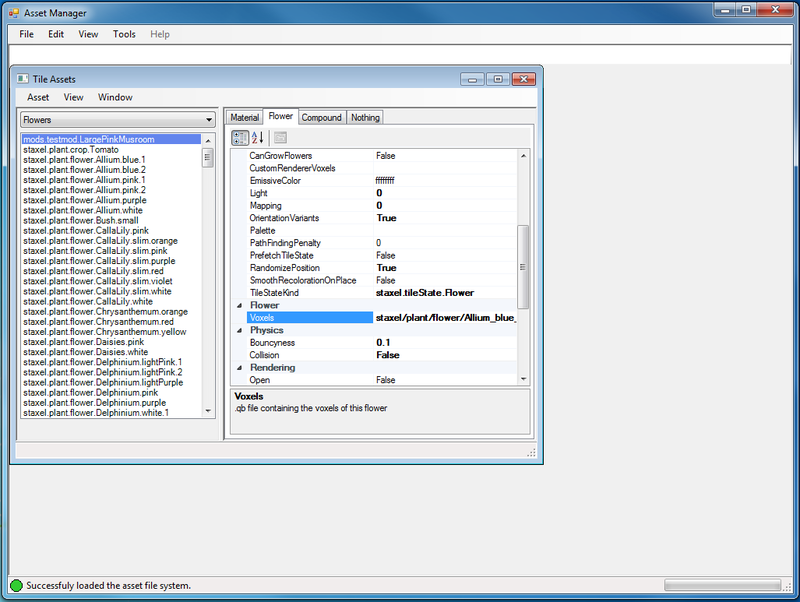 Now that you have your .qb model you’ll need to generate a .tile file to accompany it in your mod folder. There a two ways to generate .tile files. Firstly, you could write one yourself in your favourite text editor, (which is what we’ll be doing in the first example) we’ll call this “Method A”. Secondly, you could use Staxel’s Asset Manager (we’ll call this “Method B”). This option will make the process a lot easier for players who don’t have much experience with modding. If you are still struggling to get your mod into the game after trying both of these options then you should have a look at the “modding wiki”. This wiki can be edited by anyone so, although there isn’t much info on there at the moment, it will be a constantly growing article with the latest relevant information available. Okay so, the easiest way to start writing your own .tile file would be to have a look at the .tiles already available for Staxel’s own assets. You can find them in “%localappdata%/Local/Staxel.Launcher/gamedata/content/staxel”. Try to find an asset that behaves similarly to the way you want your item to be used in the game. 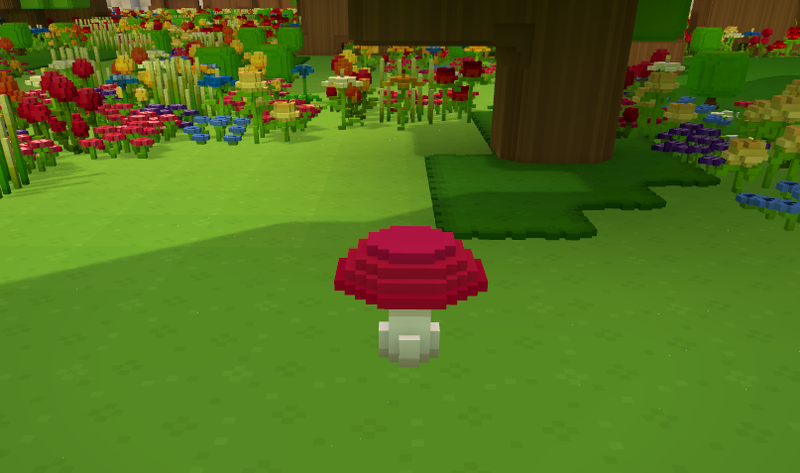 We’re making a mushroom so we’ll use a flower .tile (in this instance “Allium_blue_1” which can be found in /content/staxel/plant/flowers/ Allium_blue_1.tile). “categories” are the keywords that the in-game inventory’s search function will use to filter items from the catalogue, pick some words that describe your item’s design and replace the ones here with those. Since we’re making a pink mushroom we’ll use the tags “mushroom”, “toadstool”, and “pink”. Now save the .tile file with the name that matches the .qb file. At this point you should now have the two files you need in your mod folder and you’re ready to get them into the game. For this last step you’ll need to use Staxel’s Content Builder (default location is “%localappdata%\Local\Staxel.Launcher\gamedata\bin\Staxel.ContentBuilder.exe”). All you need to do is start the program, click “Validate Resources” and if you’re putting them on a server click “Upload to server”. This will also create a cache file for the asset in your mod’s folder (this step applies to installing 3rd party mods as well after placing them in the “mods” folder). And that’s it! Your first Staxel mod should now be available in the game so all that’s left to do now is go and try it out! The Asset Manager does what it says on the box. You can use it as an interface to see the locations and configurations of all the assets in Staxel. For this tutorial though we’ll just be covering a simple way to get your items working in the game, a more in-depth guide will be available at a later date so again, keep an eye on the modding wiki at http://wiki.playstaxel.com/Modding. In the Asset Manager‘s main window you would open the “View” menu, and depending on the type of asset you’ve created, select the appropriate option. 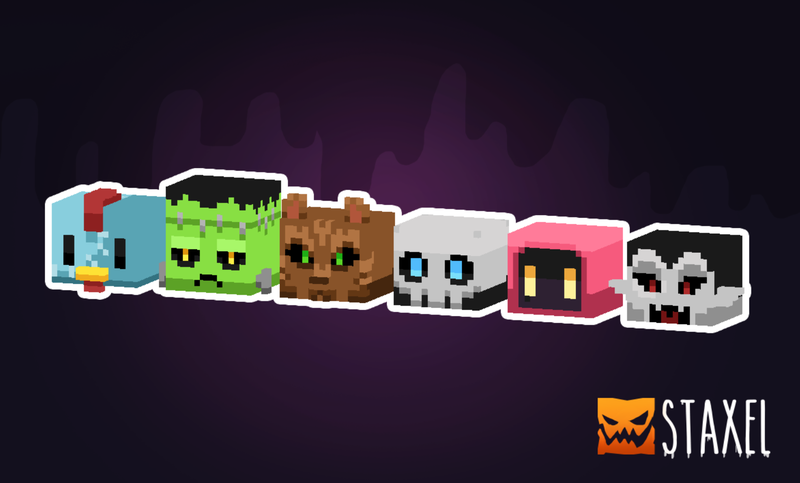 We’ll be using the “Tile Assets” type in this example. Choosing this will open a list showing all of Staxel’s assets of the “Tile Assets” type. So right now, at the top of this new window (below the menu) we have a drop-down list with different kinds of Tile Assets. 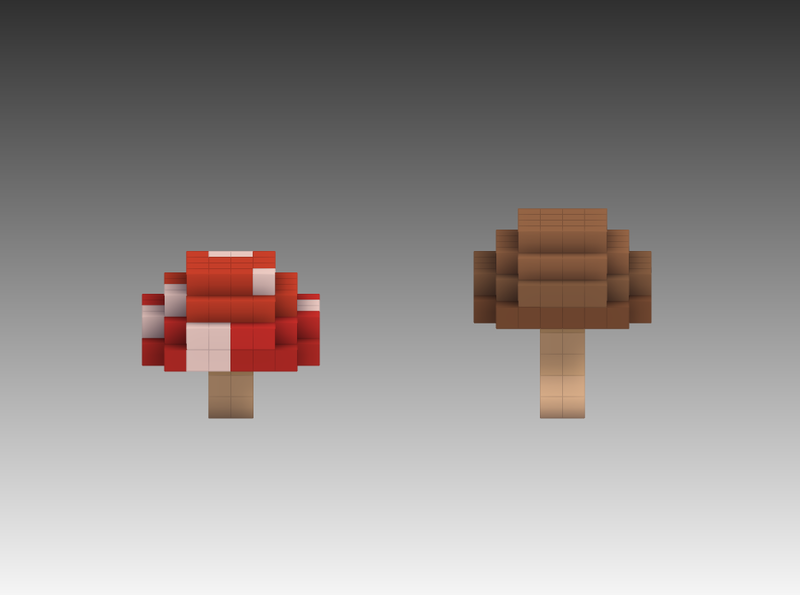 We’ll select “Flowers” as they’re the most similar to the mushroom we’ll be modding in. 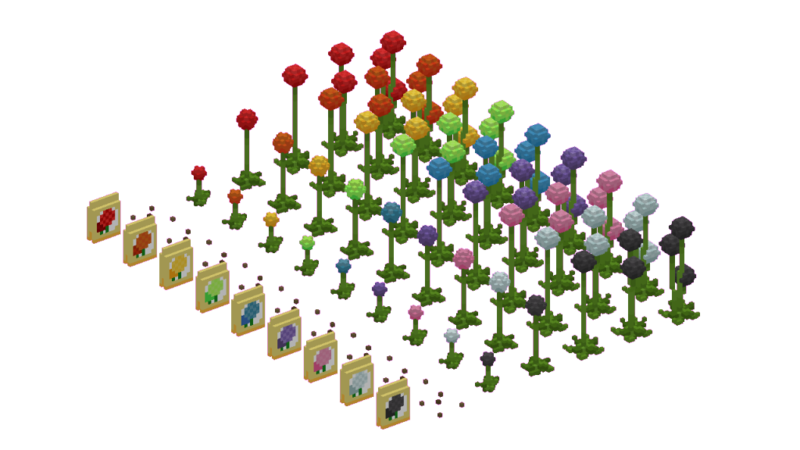 You can use this opportunity to have a look at the properties for all the flowers in the game, but for now we’ll just pick one to clone the configuration from that will be used to generate the new .tile file for your asset. Once you’ve chosen one you’ll need to clone it by clicking “asset->add->clone asset” and then in the box that opens up we’ll change the settings to what we need for our own .tile file. “Kind” We’ll leave this as “Flower”. Now we can take a look at our new asset which will be in the list of flowers. When you find it, click on it and you’ll see the configuration displayed on the right. Here you can edit all the information about the object you’re working on. Each parameter is pretty self explanatory. Now, we’re nearly done, we just need to tell it what .qb model to use so scroll down the config list until you find “Voxels” and then click on the filepath to change it to the .qb file in your mod’s folder. We’ll be using “mods/testmod/LargePinkMushroom.qb”. The next step is to save the asset in the main window’s menu by selecting it from the list of flowers, and in the menu clicking Asset>Save>Asset. Finally we just need to build the asset, on the main menu click File>All Assets>Build and Validate assets. Congratulations, our mod should now be in the game! That’s how to add a custom item using the Asset Manager. That about wraps it up. Remember to check out the still growing modding wiki for more information on modding. If you have any questions or need any help feel free to post on our forums, or join us in our IRC channel. Thanks for reading, now get out there and make some awesome mods! Staxel Seedling Edition is out! The moment we’ve all been waiting for is finally here, we’re live with our first publicly available build, affectionately dubbed the “Seedling Edition”! Now let me take a moment to give you a clear idea of what you can expect from the Seedling Edition. It’s essentially a ‘Creative Mode’ building experience, there’s a nice variety of blocks and items to make use of and an unlimited open world to put them in. The Seedling Edition will give you an idea of our game’s visual style, and let you get to get a bit more hands-on by trying out the building mechanics we have in place so far. You will also be able to do a little bit of modding. We’ve made it very easy to mod in your own content, so if we’re missing a hairstyle you’d like to use you can just add it yourself! Speaking of hairstyles, you have the option to customise your character with a range of available hairstyles and clothing. 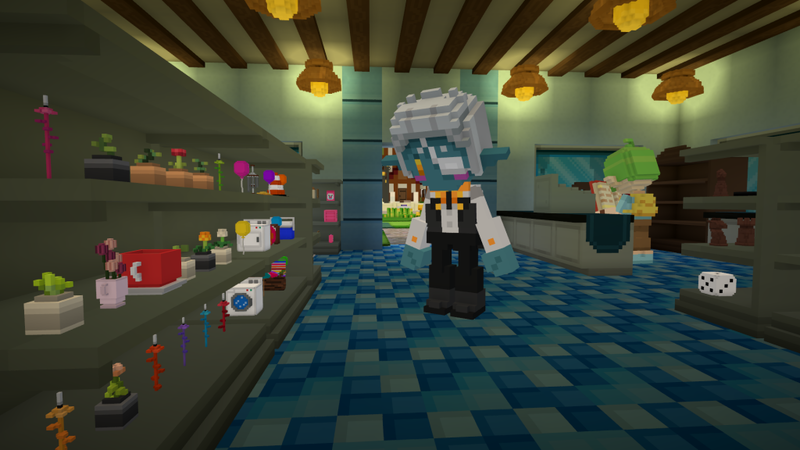 This is going to be a huge feature for Staxel and the items available to you right now are only a sneak peek at what stylish attire you can expect in the future! Right now the game is exclusively available at the store page here on playstaxel.com/store for just $5. Buy today and when the finished game arrives on Steam you’ll receive a steam key too! That’s all folks, hope you have a blast with Staxel’s Seedling Edition! Hey all! 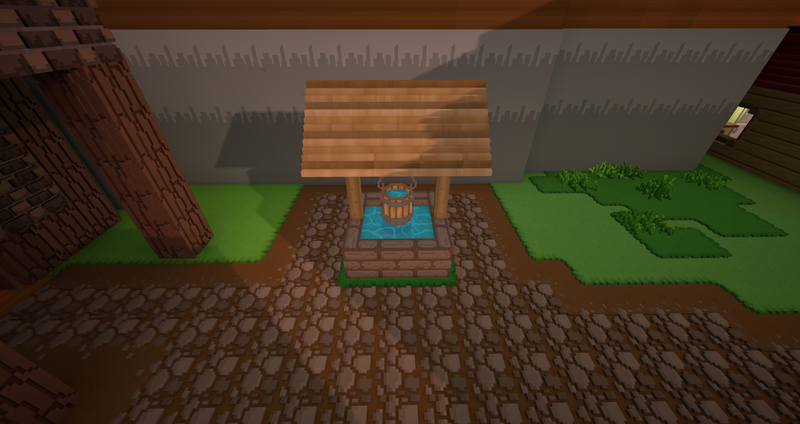 This issue of the Staxel Reporter only has one article, a pretty exciting announcement! We have a big surprise for all of you, tomorrow Staxel’s “Seedling Edition” is going to be available to purchase! What’s in the ‘Seedling Edition’? 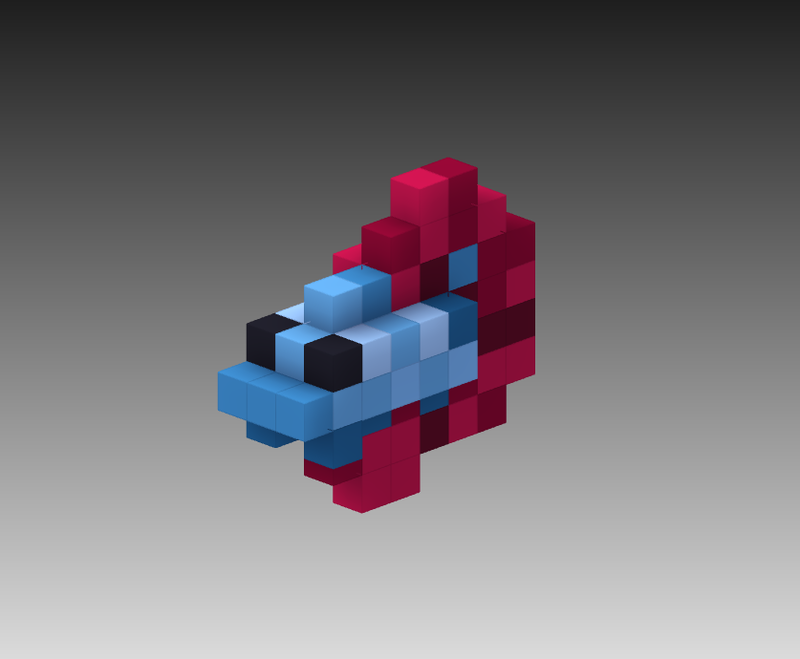 Now I need to make it very clear, the ‘Seedling Edition’ is a very early look at Staxel. The gameplay we have envisioned for Staxel isn’t there yet! What is there, however, is ‘creative mode’ building. 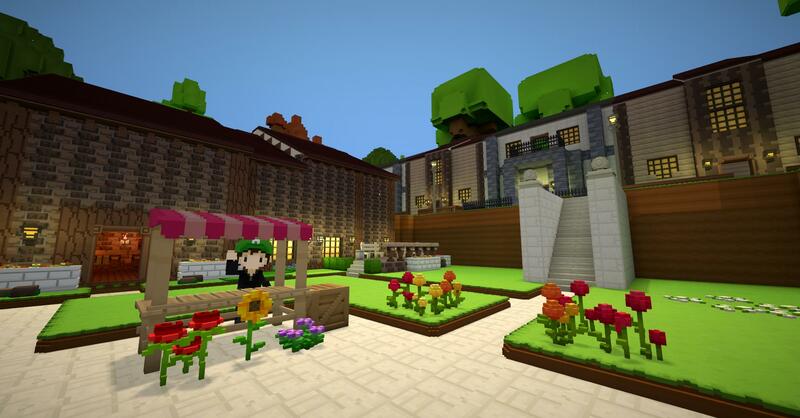 In this mode, you’ll have unlimited access to a huge variety of blocks, furniture, and objects. You’ll also be able to get a feel for Staxel’s visuals and atmosphere and maybe get an idea of what kind of game we’re envisioning. We’re putting the Seedling Edition up for $5. We feel like this a good price as it rewards players for getting involved so early. 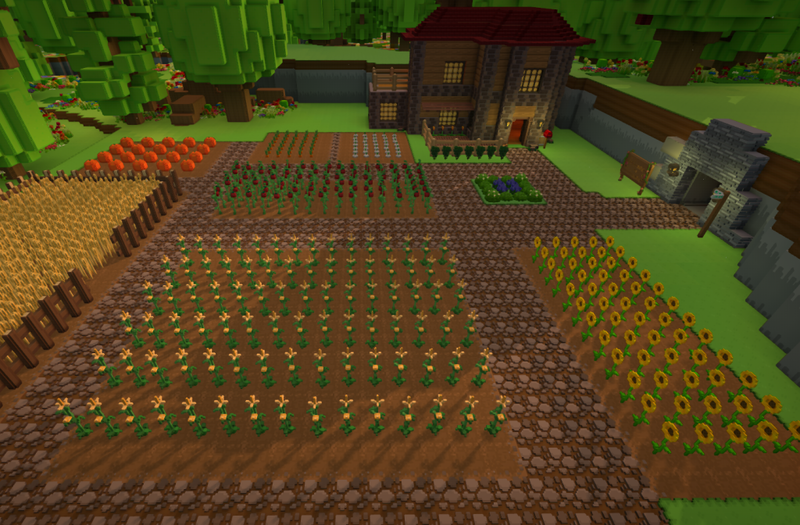 Whoever purchases the Seedling Edition will also get a steam key of the full version of Staxel once it’s complete. Seedling Edition will be updated while we are building towards the full version of Staxel. 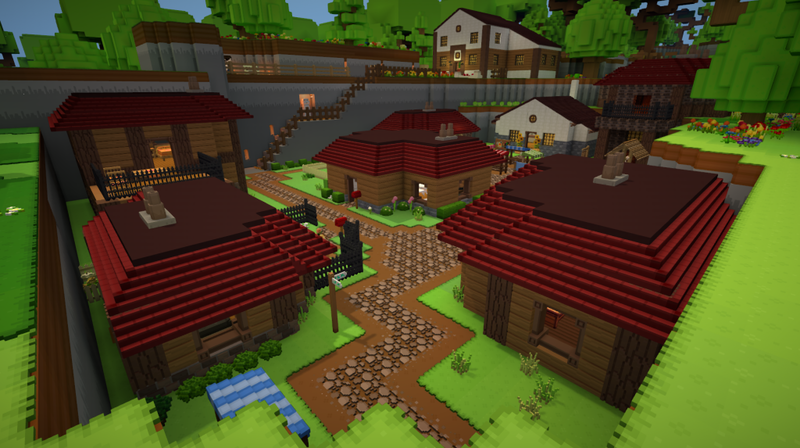 The ‘Seedling Edition’ will only be available on our official website http://playstaxel.com/, so make sure to keep an eye on it! Well, that’s it for this issue of the Staxel Reporter! Thanks for reading!